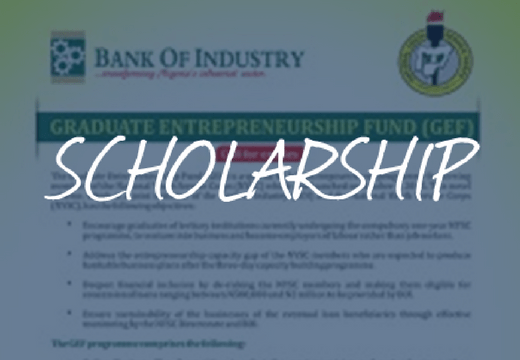 Opportunity abound for members of the National Youth Service Corps (NYSC) with entrepreneurial skills as the Bank of Industry (BOI) launch the Graduate Entrepreneurship Fund (GEF). Bank of Industry (BOI) is Nigeria’s oldest, largest and most successful development financing institution. It was reconstructed in 2001 out of the Nigerian Industrial Development Bank (NIDB) Limited, which was incorporated in 1964. The bank took off in 1964 with an authorized share capital of 2 million (GBP). Encourage graduates of tertiary institutions currently undergoing the compulsory one-year NYSC programme, to venture into business and become employers of labour rather than job seekers. Address the entrepreneurship capacity gap o the NYSC members who are expected to produce bankable business plans after the three-day capacity building programme. Deepen financial inclusion by de-risking the NYSC members and making them eligible for concessional loans ranging between N500,000 and N2 million to be provided by BOI. Ensure sustainability of the businesses of the eventual loan beneficiaries through effective monitoring by the NYSC Directorate and BOI. 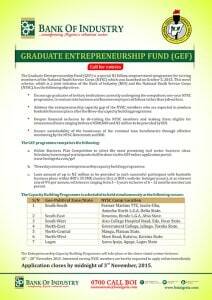 Online Business Plan Competition to select the most promising real sector business ideas, Selection/screening of participants shall be done via the GEF online application portal. Three days intensive entrepreneurship capacity building programme. Loan amount of up to N2 million to be provided to each successful participant with bankable business plans within BOI’s 35 SME clusters (list at BOI’s website: www.boi.ng) at an interest rate of 9% per annum, with tenors ranging from 3-5 years inclusive of 6 – 12 months moratorium period.